Notes: Based on the Matsumoto Leiji manga "Battlefield". From the Editor: I'm a first-generation Filipino immigrant, adopted into a family with Jewish origins, and therefore had forebears on both sides of my family fight in World War II, one grandfather fighting against the Japanese, the other against the Germans. I know full well of the atrocities committed during that terrible war. But it is impossible for me to hate the peoples of those countries for the sins created by a sick few - grudges are simply not meant to be kept. Not the way I see it. The Cockpit is a series of 3 OAVs focusing on three separate stories of the tragedy of war. The first, Slipstream, follows a Luftwaffe pilot who must choose between his duty to his country: to guard a bomber loaded with Germany's final hope of victory, the world's first atomic bomb - or his duty to the world, to let it fall in flames to enemy Spitfires and be a footnote in history. Of course, things are complicated by the plane's other cargo ... the woman he loves. The third story, Knight of the Iron Dragon, is set on the Philippine island of Leyte, where a rusted old motorcycle tells the story of two Japanese soldiers who returned to a captured airfield to fulfill a promise, a promise that neither could ever keep. Based on a manga by Matsumoto Leiji (Captain Harlock, Galaxy Express 999) and directed by three of Japan's finest anime directors, Kawajiri Yoshiaki (Ninja Scroll), Takahashi Ryousuke (Armored Trooper Votoms), and Imanishi Takashi (Gundam 0083), these are stories of what it means to be a human at war. Short but intense, The Cockpit is a true masterpiece in dramatic film. Each story is well-plotted and well-directed, with masterful aerial sequences, sympathetic characters on all sides, and a very human drama that will tear at your heart. Though definitely controversial material for the United States, as it depicts World War II from an Axis viewpoint, the stories here are, sadly, universal, as these men who might have changed the world in peacetime go through hardships, are forced to make decisions that result in death and destruction. Again, this is one series that drives home the fact that war is a truly insane behavior of man, one that almost becomes its own beast: a beast that readily consumes men who didn't have to die. Only enhancing the quality of the series is the meticulous detail in which every plane and machine in the series is portrayed - from the Spitfires and Focke-Wulf Fw-190s in the first segment, the Ohka bombs and their carriers in the second, the cobbled-together motorcycle in the third...each is very real and recognizable to any World War II scholar. The art in this series is definitely signature Matsumoto, though some of his odder-looking characters in the latter two segments take some getting used to. The interaction between the characters is nothing less than realistic, and though the subject matter is truly heavy, some of the material (especially in the third episode) is on the comic side. The characters themselves, whether Harlock-style handsome or caricaturish, have distinctive, well-developed personalities, no matter what side they're on, which further illustrates the madness of a war that turns a man with hopes and dreams into another casualty, another number in the list of the dead. 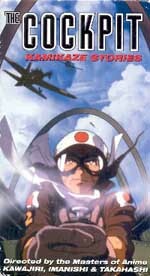 The Cockpit is a genuine masterpiece in the medium of anime, an opportunity to experience one of anime's more powerful stories - one of very human suffering and honor, and an unexpected sympathy and understanding for all of the victims of the war. The average Japanese or German was no less, and no more human than anyone else, and this anime tells the story or the front line just as effectively as Grave of the Fireflies depicted the tragedies of the home front. If any criticism can be made, it's that it does not examine Axis atrocities, nor does it examine the American motivation behind the bombing campaigns on the home islands, or the clearly racist antagonism presented by all parties involved. Those are stories better shown by other movies readily available, such as Schindler's List, Empire of the Sun, Grave of the Fireflies, or even contemporary propaganda such as Disney and Seversky's Victory Through Air Power, Leni Riefenstahl's Triumph of the Will or even proto-anime such as Seo Mitsuyo's Momotaro Umi no Shimpei. The Cockpit was never designed to outline both sides of the war - but as a series of vignettes, it does as much as it can, and then some. The Urban Vision release is currently out of print, so if you find a copy of The Cockpit, rent it, or better, buy it. It's an experience you won't regret. Recommended Audience: Too violent and intense for children, as this is a war drama that pulls very few punches. Older teens and adults would appreciate this dramatic work.